Time for another photograph of one of the carnivorous plants I am growing in my basement. And so here we have a plant whose leaves are truly beautiful. Heliamphora heterodoxa is a type of ‘pitcher plant’ whose entire leaf is a pitcher, as opposed to the pitcher growing from the tip of a more ‘normal appearing’ leaf (some photos of these to come). Nectar is produced from the reddish appendage at the top of each leaf in order to attract insects, and when one falls into the pitcher its ‘look out below’, as they drown in the water and digestive enzymes at the pitcher’s base. These beautiful plants are native to the high mountains in Venezuela and Brazil. While they are slow growing plants, I can see some definite growth in the few weeks that I have had mine. 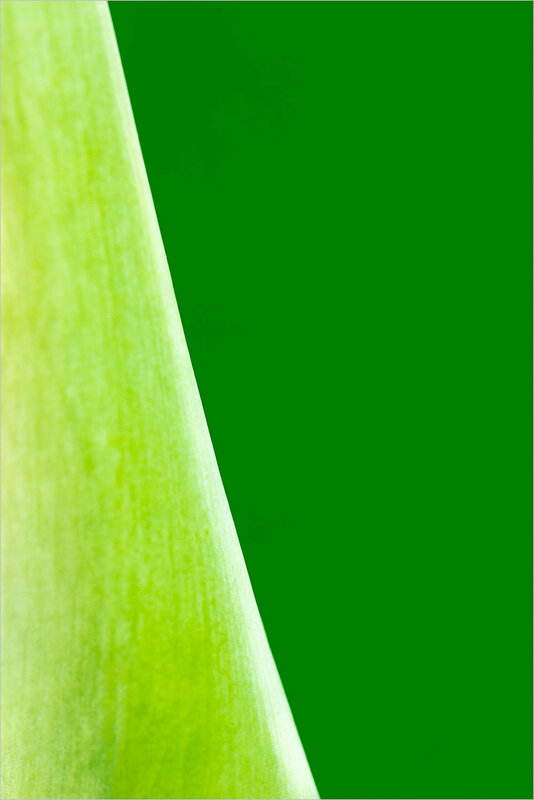 The plant’s, color, shape and symmetry are what made me want to photograph it almost as soon as I received it. I think you’ll agree that they are very ‘photogenic’! These plants are both beautiful and intriguing! I have been fascinated by the spines of this Echinocereus species cactus at Phipps Conservatory for some time. In fact, I have taken several photos of it in the past but have never been happy with the images for one reason. The spines are so long that when I fill the frame with them using my 180mm macro lens it simply isn't possible to get all the needles sharp along their entire length, even at f16 or f22. The depth of field just isn't great enough. I really should say that it isn't possible to get them all sharp in one single frame. Last weekend I took out all the stops and brought along my macro rail. The rail lets me take a series of tripod mounted images without refocusing, by manually moving the entire camera and lens closer to the subject as a unit, bit by bit. As the lens moves closer to the subject, a different area is brought into focus. I took 35 shots, each spaced 1mm apart (probably more than I needed to) and combined them using Helicon Focus focus stacking software. The software uses computer algorithms to take the sharp parts of each of the 35 frames and combine all of these sharp areas into one single image. The result is shown below, converted to a sepia toned black and white photo. 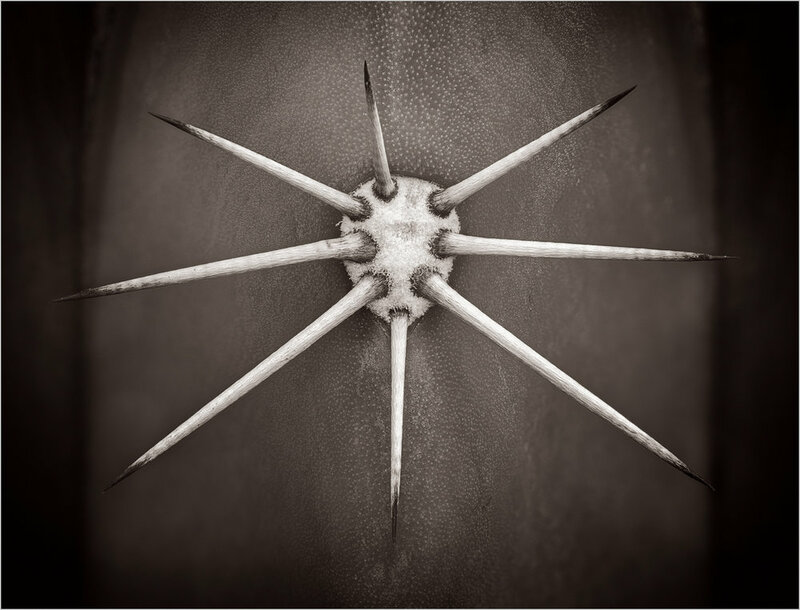 Those needles deserve to be shown in sharp focus throughout their entire length. And those tips are mighty sharp! Continuing on my black and white cactus journey of the last couple of blog posts, we have Euphorbia canariensis. As opposed to the other two images, this one was actually made a number of years ago on a trip to London, at the famous Kew Royal Botanic Gardens. I enjoy these images in black and white because removing the green color allows one to focus on the lines and shapes of the cactus which, to me, is the real 'essence' of these plants. In the winter I tend to visit Phipps Conservatory quite a bit. For one thing....it's warm in there! And their array of flowers and plants allows one to escape winter, if only for a short time. There is a saying in photography that goes something like this: 'if you are looking for something interesting to photograph always look at the edges'. The edges are where interesting things occur. Look for photographic opportunities where water meets land, where sky meets horizon, where storm-clouds meet clear skies. It is where 'the battle' takes place. I think that looking for interest at the edges is a good strategy even for simple everyday things. Like plants. I often have ideas for several photographic projects floating around in my mind. Sometimes the idea comes first and I have not yet made any photos that would fit it. Other times the idea comes after I have made a series of photos, when it suddenly occurs to me that I might have the start of a small project without having planned it. 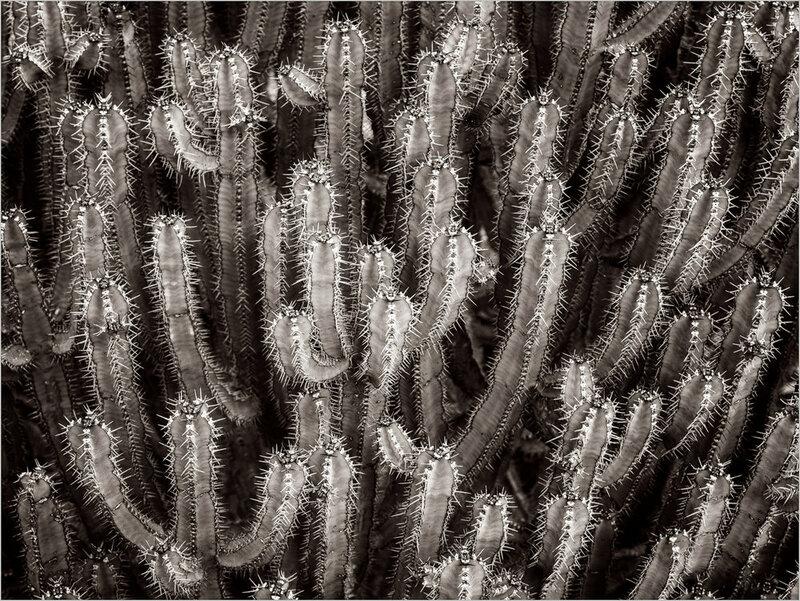 Such is the case with this cactus photo processed in black and white. 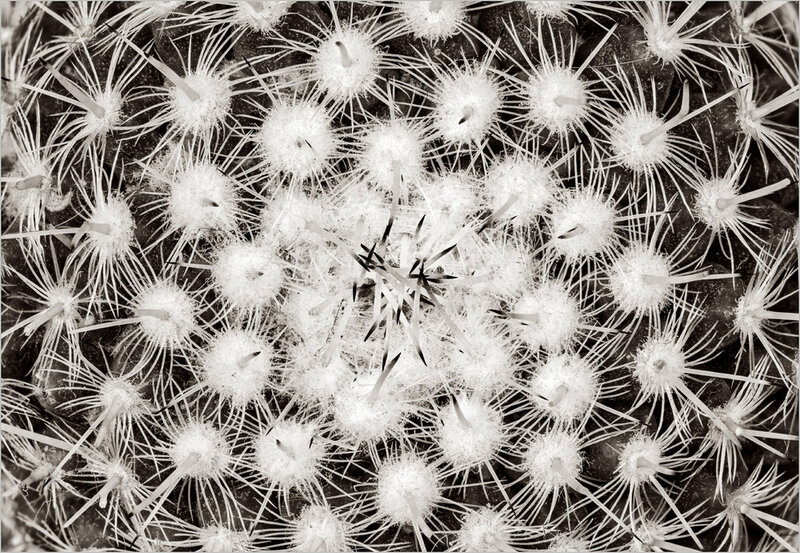 This is the first photograph I have chosen to process from a small series of cactus images I already have taken. I will simply have to see if I am able to make and process enough photos of this subject to actually put together a full portfolio. Time will tell! In my post entitled "Interesting Things Everywhere", I described how using Photoshop's invert command converted an abstract image I had made into a much more interesting photograph. As such, I thought it might prove interesting to try it with my black and white flower images, perhaps one that was particularly abstract appearing. The inversion yielded quite an interesting result with this mum, at least I think so. As a friend of mine pointed out, the inverson seems to really make the spirals far more apparent than in the original, which is below the inversion. I wonder if that is because the inversion removes the idea of the photograph being a flower and allows our brain to now see more, without it being constrained with pre-conceived ideas about what the subject is. Once free of the label perhaps we can become more aware and start to see shapes and patterns. I don't know.....just a thought. But I think this may be something that is worth trying on subjects that have a particularly abstract appearance to them. There are many reasons why a black and white presentation might be a good choice for an image. One, which was the reason that I converted this image to black and white, is that it tends to simplify the scene. The shape of the tree branches and the echoing of the branches by the smaller tree in the lower right hand corner is what attracted me to this scene. It is the reason I took the photo. At the time I made it I had fully intended for it to be a color image. But when I looked at it on the screen it simply didn't work. There were too many shades of green and too many leaf shapes distracting the viewer's eye from the broader lines and shapes. 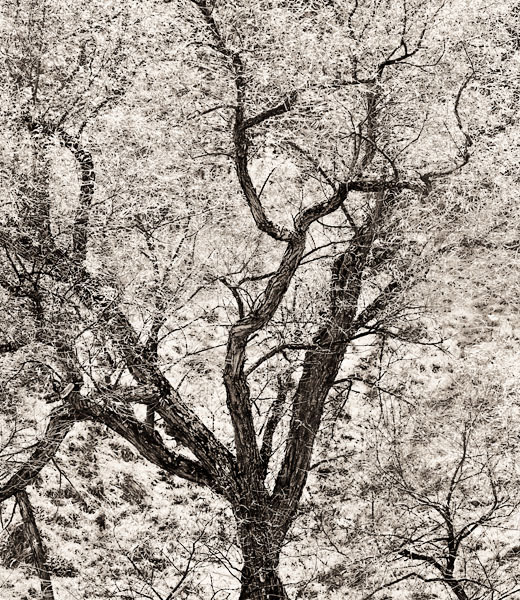 It was the larger shapes of the trunk and branches that drew me in, not the micro-details in the leaves. So I decided to give it a try in black and white with a higher key effect to help lessen the details in the leaves. It worked for me. The image became much closer to my original vision. Black and white saved the image.......or at least allowed it to transmit what it was that I was feeling and what it was that made me take the photograph. One of the wildflowers that I seem to have missed in years past is the trout lily. They are quite small, which is one reason I may have missed them, but they also have beautiful speckled leaves. This year I was a bit early, as they were out, but the flowers had not yet fully opened. However, even closed they possess a very dainty beauty. They are a bit tough to photograph on their long stalks with the flowers drooped downwards, as the slightlest breeze makes them bounce all over. It was this constant movement that made me want to make a photo with a shallow depth of field, which I felt would impart that feeling of motion by blurring most of the flower but still show the delicateness by leaving a small area of the plant sharp. The connection of the stalk to the flower seemed to me to be the best area to focus on. After a somewhat late start, the wildflower season in Western Pennsylvania has begun! These trillium were growing in Cedar Creek park (finally an image from this year!) on May 2nd. I used my 24mm tilt shift lens to obtain front to back sharpness. What does one do when a self-contained project appears completed? Or at least completed enough that it can stand alone now even if more were added later? This is an important question if one of your goals is to get your work 'out there'......if you want to get it seen. Brooks Jensen, the editor of LensWork, has commented on this issue many times in his writings and podcasts. In the current era there are many, many ways to get your work seen by an audience. In fact, any one person might choose to put their project into several different formats in order to have it available to a larger audience. For example, an exhibit is only available to those who live locally. Putting together a folio that one could sell might limit the number of people that can see your work because of the necessary price point. Brooks has advocated having multiple formats/media so that you do the work in order to make it easier for others to view and appreciate what you have put together. Now that I have finished my black and white flower project entitled "Floral Forms" and written an artist's statement, I thought it might be worthwhile to enumerate my plans for the project in terms of making it available to an audience. One of the issues, of course, is that (unless you are intimately familiar with all the software involved) it does take a good deal of time to learn the software and, at least for me, a lot of time to get the jobs done. This takes time away from new projects or from working on the large amount of images I have waiting to be edited and processed. Nonetheless, I do think it is time well spent because, in the end, if very few people see the work it might as well just stay on your hard drive! Yes, but where? When looking for a place to have a show one has to be reasonable in terms of how your project might mesh with the venue. And, oh yes, you must have thick skin and be able to take rejection well. I thought the project would go well at the botanical garden where I took a good many of the photos. But how does one present this possibility, especially when unsolicited? I am sure there are many ways, but the following is what I typically do. I don't send digital images when seeking a display that was not solicited. It seems just too easy to me to click through rapidly and be done. Since I am proud of my prints, I send a series of 8x10 prints, and not on proofing paper. I send them on the final fine art paper. That way the recipient has your best work and is able to handle and interact with it. I send a cover letter explaining the project and why I think it would be appropriate to display in their particular venue along with a short artist's statement. If the project is a large one I might send 10 or 20 prints rather than the whole project, to give a solid taste of what the quality is. Really, it just isn't that expensive a thing to do, especially if you compare it to the cost of matting and framing if the recipient is actually interested in giving you a show! In addition to giving an email address to return contact, I also mention in the letter that I hope it is all right to follow up with a phone call in a week or two in order to see if they are interested. You need to make the effort to follow up. The recipient might well be interested but gets bogged down in a million different different things until your prints disappear under a pile of paperwork. Just because you don't hear back spontaneously doesn't mean they aren't interested. Also, if they are not interested, the call still gives you that contact and perhaps an informative explanation of why you are being turned down. There are things one can learn from rejection! In the case of my project, I found out who the correct contact would be to send the prints to at the botanical garden and they are quite interested in displaying the prints in the gallery they have in their lobby. They are booked until next fall and they would like to consider a show for the spring or summer of 2015. Yes, it is a way off.....but still a great potential opportunity that I am pleased to have received. If you are not familiar with the folio concept (also created by Brooks Jensen) you can find information about the two prior folios I have put together here. I do plan to make folios from this project as well. Because the folio holder only comfortably holds ten prints with the supporting material, this project will have a volume 1 and 2. This post has covered what I plan to do with physical prints. In my next post, I will talk about my plans using electronic media. I have one plan that I am particularly excited about that involves a collaboration......but more on that next time! 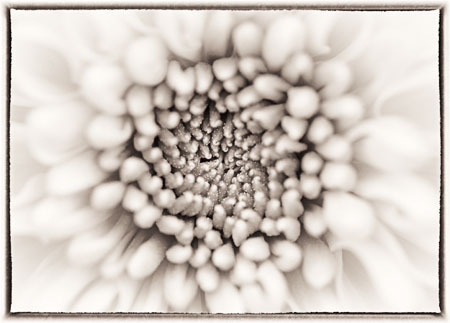 As I have been working on my flower photographs, I have found that some images just seem to 'work' in black and white. And I have found that it can sometimes be difficult to predict when that is going to be the case. What I have therefore been doing is to take photos where the flowers have interesting forms and shapes and quickly try a black and white conversion. By that I mean spending 60 seconds on it, or, at times, just looking at it in Lightroom by hovering over a series of black and white presets that I have, even though I don't do my conversions in Lightroom (I use the Silver Efex Pro plug in for Photoshop......not that you can't do a great conversion in Lightroom....you can). If one of these quick exercises look promising, then I will start over and spend the amount of time needed to really work on getting the conversion I would like. This generally involves first making a color image with good color and tonal separation (which might mean that it doesn't look the way I would particularly want the finished color version to look), spot it, and convert to black and white with Silver Efex Pro. I then generally work on local areas of the image with curves and, more recently, both curves and a dodge and burn layer. To illustrate, below are three color images. Two of them did not seem to 'work' for me in black and white. I force myself to 'give up' when I find I am really pushing and pushing and can't make it work. Which one became the one with a black and white conversion that 'worked' and will become part of my black and white botanical project? Don't cheat.....scroll down slowly and just look at the color images first! See what you would predict. The black and white versions with my opinion are further on down. The image above (Trillium erectum forma luteum) is the one that 'works' for me in black and white. There is a nice range of tones and contrasts, from the black background to the dark center with white petals and gray leaves. I liked it as soon as I saw it. Aas for the two black and white images below........they don't seem to work for me. They don't have a wide enough tonal range with enough contrast and they are not going to be included in my collection. However, I wasn't sure of this before I made the conversion. Both images are ones that I learned a lesson with. I liked the color versions and kept spending time 'pushing' to make a black and white version that I liked. But it just wasn't working. My lesson was that when it comes to these conversions you will generally know pretty quickly if it is going to work in black and white. If the time you are spending isn't fine tuning, but, rather a continued effort to make the black and white version work....well, there is a reason for that! To quote The Beatles, "it's been a long cold lonely winter". Yes, this winter has been quite bad, particularly in my neck of the woods, and perhaps in yours as well. Sub-zero wind chill, constant snow, and gray skies. I know some people thrive photographically in the monochrome of winter, but I am not one of them. Call me a wimp, but I just find it difficult to be creative when I am ....well, cold and uncomfortable. And this year has been worse than most. But we can soon put that behind us because, as the title of this post suggests, springs a comin'. And soon. And spring is my absolute favorite time of year for photographing. One day I look forward to being able to photograph throughout spring and not just a day here and a day there. One of my favorite spring subjects are trillium. I find it particularly difficult to make compelling trillium images because of the forest debris that typically is scattered all among the flowers, but, still, every year I go out there and try. Even when you don't come away with winning shots (why does it always seem windy on the days I get to go out) it is hard not to enjoy shooting on a spring morning. It's the process, not necessarily the product! The following trillium photos from years gone by were all taken at one of my favorite spring wildflower locations, Hell's Hollow, an out of the way area that belongs to McConnell's Mill State Park. 1) Subject - While one could have flower macros as well as flower groupings, I think the idea for one project is flowers. By that I mean that if it is flowers it shouldn'e be interesting leaf macros. The leaves will be another series. 2) Toning - I believe there needs to be a coherance between the sepia toning among the group. Interestingly, If I apply the same toning settings in Silver Efex Pro, that doesn't necessarily give me results among the series of photos that seem to hold together. I suspect this is related to the fact that there I like a difference in toning strength between highlights and shadows. I tend to like purer white highlights that don't look 'muddy' and so I apply less toning to the highlights. But holding a higher key image next to a lower key image makes it appear as if there is discrepancy in the toning. This is something I suspect I am just going to need to adjust by eye, as opposed to having a one size fits all recipe. 3) Editing - Obviously one wants to only show their best work, but, even with a number of photos that might be appropriate, you still need to cull the number down (or up) depending on the presentaton. The 'proper' number for a show (which itself will be somewhat reliant on the amount of wallspace and image size) will be different from the number that might be optimal for a folio or a pdf or an ebook. Along the same lines, the image size will also depend on the presentation venue. I suspect this will still take a couple of months, but I am starting to feel that it is time to start thinking about putting things together into a stand alone project. Some time back I had written a post about an image that I had made that was purposefully unfocused at the time it was taken. It had a certain feel to it that seemed to convey a 'dreamlike' state where the colors and shapes took over from reality. That post, called Unfocused, can be read here. Well, one would think that it would be easy to make a series of images like this......just aim, throw off the focus, and shoot. It is easy enough to do, but I found it terribly hard to produce images that conveyed the feeling I was looking for.....a dreamlike, 'trancelike' image. I am pleased that I now have another image in the series that, to me, matches the feel of the original. The second in the series. As I work on and process individual images from my growing collection of black and white botanicals, I tend to process and tone each individual image as a 'stand alone' photograph. My ultimate aim however, once I have a nice collection, is to put my favorites together as a unified project. As a scan over the finished images, I can immediately see some difficulty. The toning, while optimized to my eye for any individual image, is a bit different for all. Some tend towards the paler and less saturated sepia tone and others are more saturated. Ultimately they need to all hang together as a unified project with some consistency to 'the look'. This is yet another issue to take into account when dealing with a project, as opposed to a single wall hanging. Every so often it is a worthwhile endeavor to review your old, unprocessed photos to see what is lurking there that you may have missed. When you go back at a much later date you sometimes see things differently and with a fresh eye. In my case, I also let a lot of images go unprocessed just because of a lack of time coupled with the fact that I might not have been thinking of a specific use or project that the image might fit into. Having recently embarked on my little project of putting together a series of black and white botanical images, I thought that it might be worthwhile going through some of my older flower images that I never processed. I found some that are, in my opinion, worthy of addition to the series. This is the first one that I have uncovered on the old hard drives that I thought worthy of processing. Old images can be definitely be useful additions to new projects. During the winter, when it is just too darn cold out, I frequently go to the botanical garden near my home on Sunday mornings to make photographs. Most of the time the displays are pretty static except, of course, for what happens to be in bloom at the time. But several times a year they have special shows......a winter flower show, a sping flower show etc. Well, last weekend was the opening of their "Orchid and Bonsai Show". I have always liked orchids, 'the most sensual of all flowers'. In fact, at one point I used to raise them in a growing room I had constructed in my basement. But I had always found it a bit difficult to make photographic compositions that did them justice beyond a straight 'this is what it looks like' shot. This last weekend, during the show opening, I did get several orchid photos that I am pleased with. And, of course, I tried to move some into my ongoing black and white botanical project. I thought I would show two more photos related to The Muse. One is a black and white conversion of the original photo from that post and the other a different composition from the same type of flower.